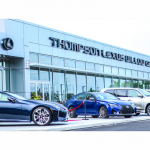 When the Thompson Organization built their flagship Lexus store they wanted a service department to match, including a state of the art oil distrbution system. The design focussed on providing both outstanding service for the vehicles PLUS productivity tools for their technicians. 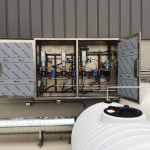 By supplying all fluids, electricity, air and nitrogen directly to each service bay, the technicians can provide better service, faster and with less effort than ever before. 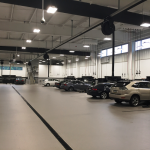 Given the sharp competition for quality service techs, Thompson’s state of the art facility helps them attract and retain the best technicians in the industry. Haldeman installed enclosed hose reels, giving the service area a finished look consistent with the quality of the vehicles being serviced. With 4 oils, 2 air plus electric and nitrogen reels at every bay, the technicians stay in their bay and stay productive. 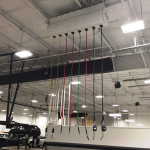 To complete the package, a state of the art wireless Fluid Inventory Control (FIC) system was installed. Every drop of oil that moves through the facility is tracked and accounted for. The parts room enters each oil service onto a work order and at the touch of a button the tech records the completed dispense. No more missed billings because someone forgot to add the oil service to a work order. 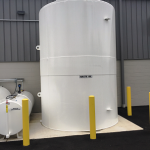 This project recieved an environmental stewardship award from Montgomery county in part for its handling of used oil. 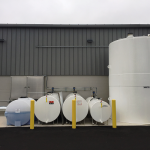 Photographs of the storage tanks are prominently featured in the write up done by the Montgomery County conservation District.